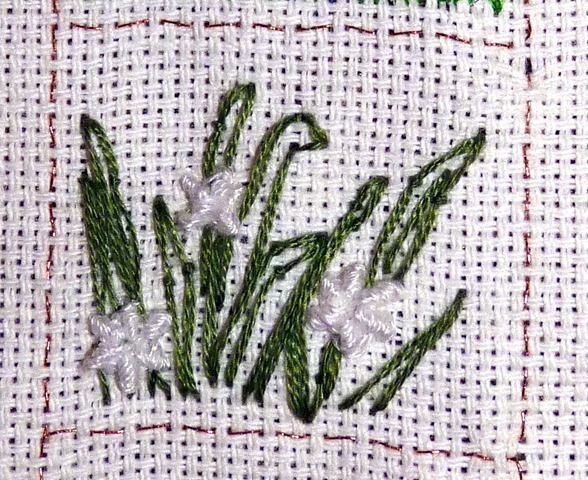 Week 9 of the TAST (Take A Stitch Tuesday) Challenge was the Couching stitch. 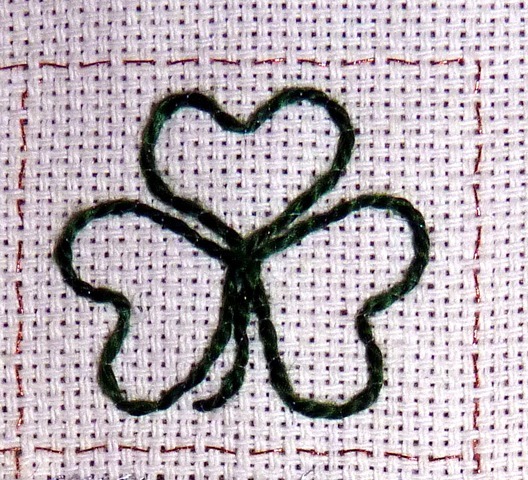 For my sampler, I made a shamrock using Pearl Cotton and “invisible sewing thread”. 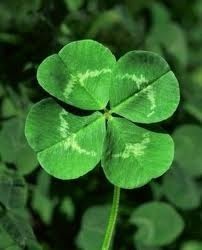 “According to tradition, such leaves bring good luck to their finders, especially if found accidentally. 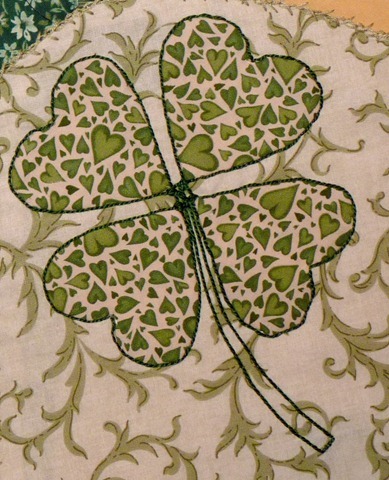 According to legend, each leaf represents something: the first is for faith, the second is for hope, the third is for love, and the fourth is for luck (the three-leaf shamrock had been used by St. Patrick as a metaphor for the Christian Trinity).” It went on to say there are about 1 four leaf clovers for every 10,000. Guess I was pretty lucky to find the few that I did (still have one pressed in my Bible from those days). 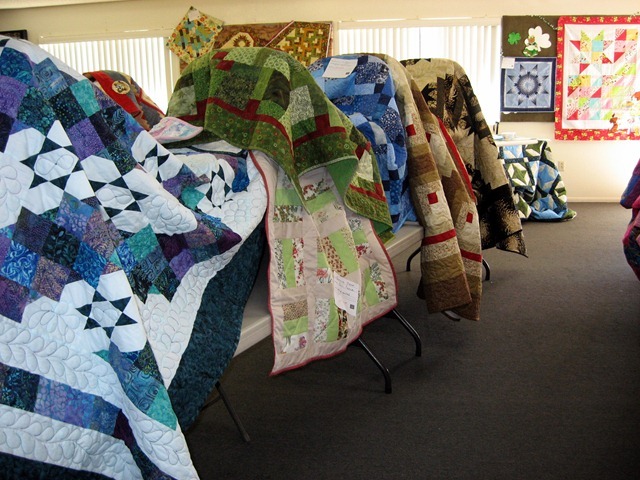 My CQJP (Crazy Quilt Journal Project) block this month is titled “March in Yuma”. It embodies some of the more memorable events of the month. We live full time in an RV and spend 6 months of the year as “snowbirds” in Cactus Gardens RV Resort in Yuma, AZ. The 400+ site park has become our winter home with friends. The exodus toward the north begins in March, and there are always many “end of season” parties, each one a “last chance to get together with friends” before heading our separate ways. I appliquéd a 4 leaf clover to symbolize the 4 end of season parties we attended. Each one was separate, but the friends involved are interlocking and combined, just as the leaves on the clover. I used the same pearl cotton to couch around the leaves and create the stem. Later in the month, I used the couching on several more elements of the block. I found I liked the way it defines the seams. Week 10 brought the Running Stitch. 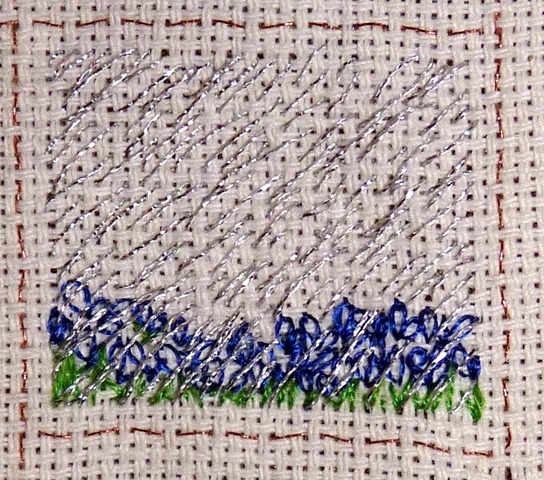 I had just used the detatched chain stitch a few weeks ago to depict raindrops, but the running stitch also whispered “rain” to me. This time, I created a bed of Texas Bluebonnets at the bottom of the square. Have you ever seen the Texas Bluebonnets in the spring? There’s nothing like it! 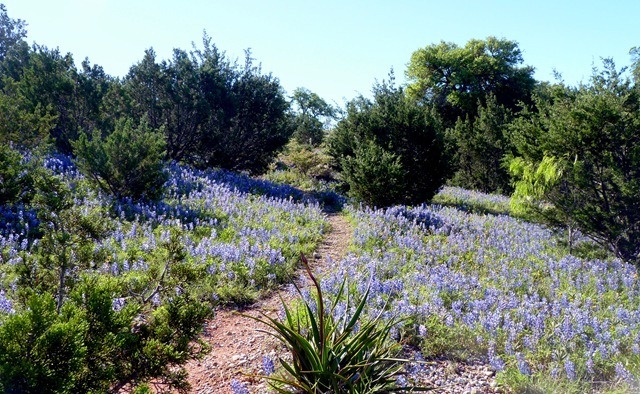 To see more of Texas’ famous wildflowers, see my blog posts here. They cover entire fields, hillsides and valleys with their beauty. They don’t come every year, only on the years when there’s been enough early spring rain. 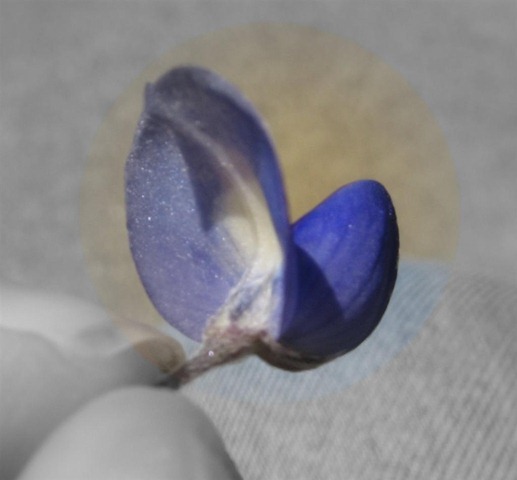 Why are they called bluebonnets? Here’s why…they look just like a minature lady’s bonnet. In my sampler, they’re lifting their faces in gratitude toward the life-giving rain. Week 11’s stitch was the Whipped Wheel. The Whipped Wheel is similar, except for the raised effect. Instead of an over and under weaving, the weaving is under two, around one. We used to own property that included a wooded area on a hillside. One spring, walking through the still mostly bare woods, I was delighted to find a cascade of tiny star-shaped blooms flowing down the hillside. 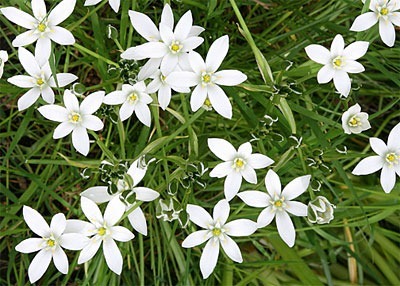 Doing some research, I discovered they were “Star of Bethlehem”. The tiny bulbs must have washed down from the home site above over the years, and lodged in the woodland soil. I transplanted some to my flower/herb garden and enjoyed them each spring thereafter. 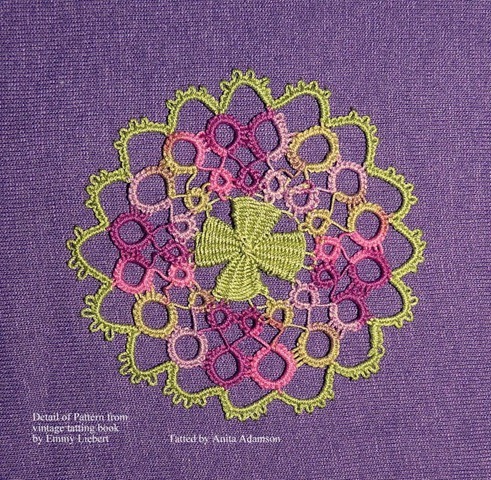 The small whipped wheel was a little difficult to accomplish on my sampler (with each week’s area barely more than an inch square), but I tried to illustrate the Star of Bethlehem. Court details were stitched with the Running Stitch. Week 12 brought March’s last stitch, the Barred Chain. 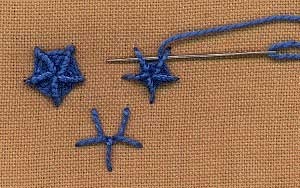 This stitch took quite a bit of practice to master. 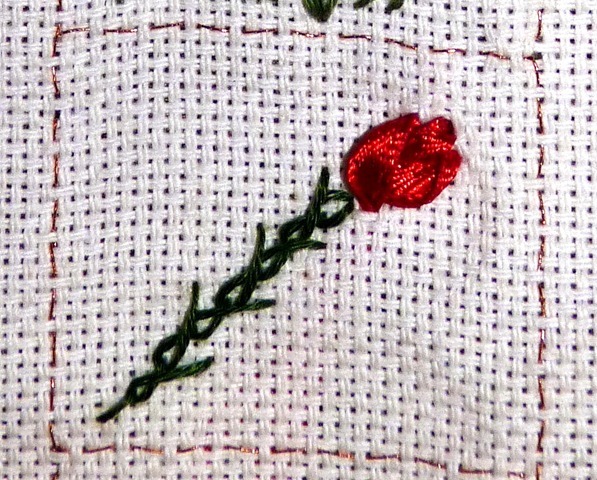 After a “thorny” start, I created this long stemmed ribbon rosebud for the sampler. 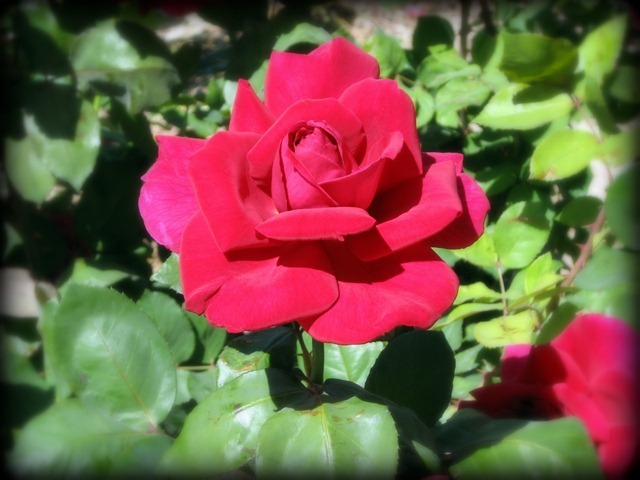 I love roses, and discovered this one on a walk just this week. 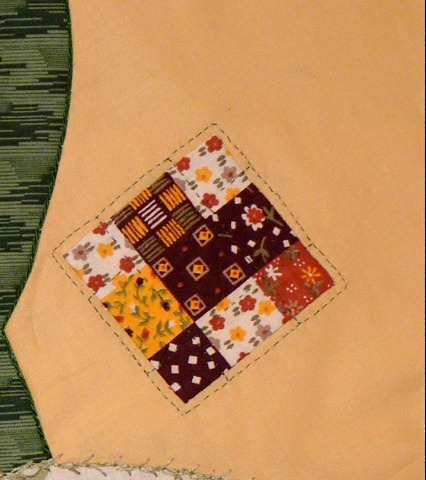 The stitch also outlines some of the seams on my quilt block. 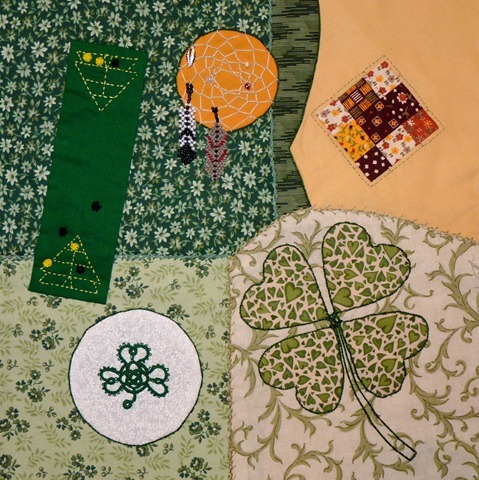 Two more elements make up the quilt block. We were invited to a Dinner Theatre. The play was Green Misconduct, and the tables were strewn with shamrocks. 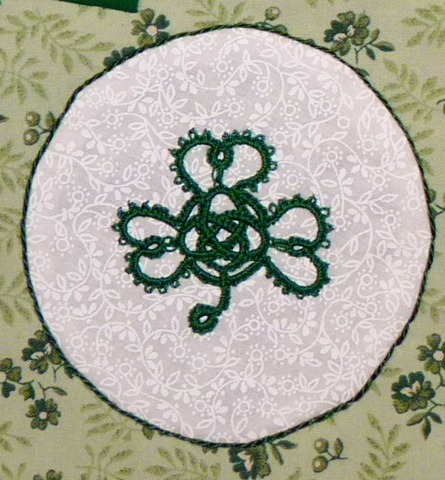 My tatting for this month’s block is a Celtic Shamrock (pattern by Yarnplayer). I mounted it on the white on white fabric, the one fabric common to all my blocks. I have a bit of Native American blood in my veins, and perhaps that’s one reason I’m drawn to the sound of Powwow drums. 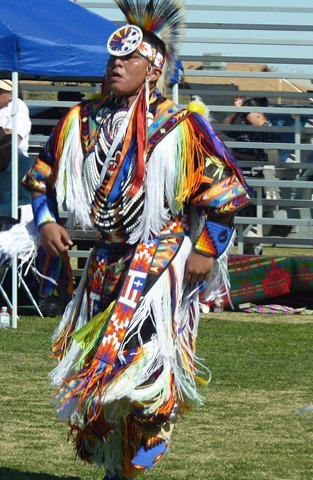 Each year, the Strong Hearts Powwow is held in nearby Bard, CA. 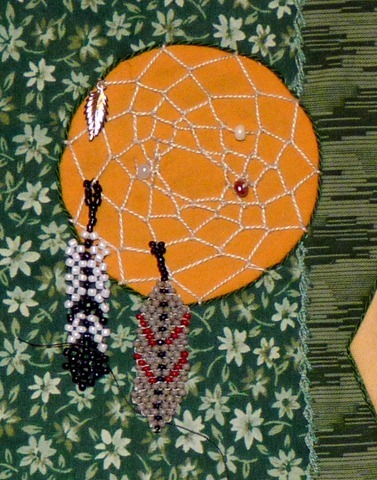 To symbolize the Powwow, I created a Dreamcatcher, with a couple of my beaded feathers hanging from the bottom. All of these elements combined make up “March in Yuma”. 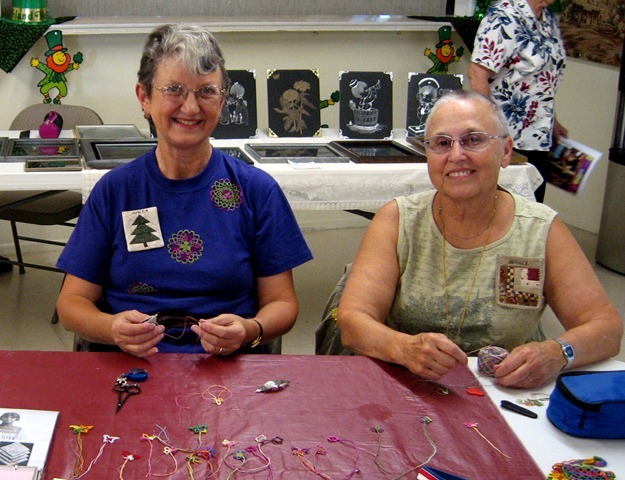 This entry was posted in Beading, CQJP, Embroidery, Quilting, TAST. Bookmark the permalink. Love the bluebonnets! This is my first year in Texas and my first time to see the bluebonnets! There’s nothing like a rolling hillside covered with bluebonnets, with just a touch of other floral colors, is there, Rose?